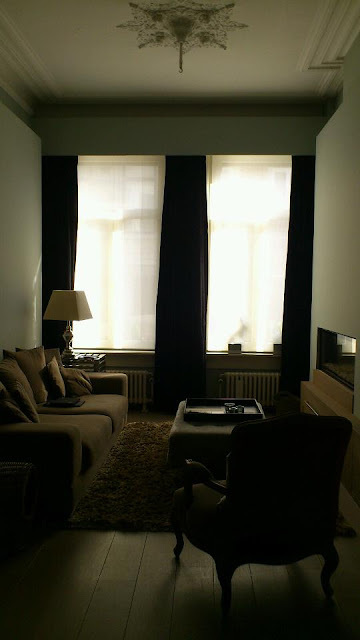 Just wanted to share this picture 'cause finally, yesterday, all our stores and curtains were installed. I am so happy with the result of all rooms ; even India's room looks amazing. Really bright but without loosing any warmth. She needed those curtains the most ; the previous owner didn't leave any curtains in her room so she played hide and seek for several months. Guess she must be really pleased to finally sleep in her room without any neighbour peeping through her windows. We also got the proposition for our bedroom from Pieter. He's got amazing decorating skills. Really good ideas and he is very talented : he can see what we really like and knows what materials would fit perfectly for this room. Now that the curtains are hung in our bedroom, you can start to see the hotelroom feel to it. Imagining how the furnished headboard will look like and compliant the rest of the colors in this room. I love the curtains. The room has good "bones"; wood floor, lighting fixture, window size, & radiator. Very appealing. It's great that you have a chance to do this, and I'm so happy for India. My parents "transformed" my room when I was about her age, and I felt like a princess in it. Will post some extra pics of India's room ; first she needs to clean up some mess ! Teens ! Ha !